This is the post in which I show the world exactly how much of a nerd I truly am, especially with regards to Star Wars. Keep in mind that I have never written a poem in Huttese. So… I guess I haven’t gone completely off the deep end, right? Now, you all already know my feelings toward the trilogy. You know that I don’t like the fact that George Lucas keeps throwing extra stuff into his masterpieces. So, I really don’t need to talk about that. Also, I’m sure most of you know enough about Star Wars and its various back stories, so I don’t need to address that. However, that Chewbacca is one hairy fellow. Chewbacca was always one of my favorite characters. Maybe it was the fact that he was almost seven and a half feet tall and covered completely in hair. Maybe it was the fact that he made that awesome noise that everyone except the viewer could understand as a discernible language. Either way, Chewbacca seemed to win every time I compared him to other characters. He always beat out the droids, but that’s because droids don’t pull people’s airs out of their socket’s when they lose. Wookiees are known to do that. Still, he’s tall and hairy and awesome. I remember watching the films for the first time. I always thought that Chewbacca should have gone to save Luke Skywalker when he was stranded on Hoth. Follow me, now. Han Solo, while valiant and brave, is just a human. He is from Corellia, a plant in the Corellian system that is very similar to Earth in respect to temperature. He is suited for temperate life, not subzero temperatures. Now, as we all know, Chewie is from Kaskyyyk, which is also largely temperate. However, he is completely covered in thick fur. He would have been able to stave off the cold much easier than Han Solo ever could. Han had to put on all sorts of coats and scarves before he saddled his tauntaun and went searching for Luke in vast frozen tundra. I mean, everyone had to wear thick coats inside the Rebel Base, hidden from the bracing elements. What did Chewie wear? Well, he had his bandolier slung around his thick neck most of the time, but he didn’t wear anything to keep himself warm. That’s what his fur was for. If Chewbacca had gone on tauntaun, he would have simply wrapped Luke up in his locks instead of slicing open his only mode of transport to keep Luke from dying. Now, I’m not saying that Chewbacca is so much better than Han Solo, but he would have been able to get Luke back to the base that night instead of sleeping inside a dead steed for warmth. 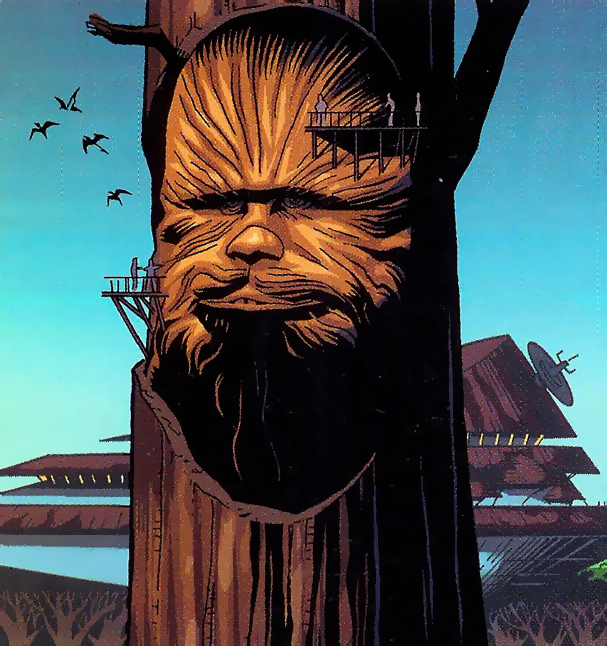 However, if Solo hadn’t saved Chewbacca from Imperial slavery, I suppose none of us would even know about the mighty Chewbacca. That is, only the fans nerdy enough to read Expanded Universe novels would know. Thanks to Sean Lee for the challenge. I suppose this is probably one of the most abstract ones, but it worked nonetheless. You guys know I can talk about Star Wars for days. Also, I only had to look up the exact details in regards to planet climates and Chewbacca’s exact height. Other thing else is stored in my head. Seriously. I need more challenges. MAKE IT HAPPEN! This entry was posted on	October 21, 2011 at 12:00 pm	and is filed under Movies. That poem was ridiculous. She didn’t have enough emotion when reading it. But, that is neither here nor there.